I don’t know about you, but, before finding this vintage vegetable drawing; I never knew there was such a thing as red or pink celery. However, all the way back in 1894, the Peter Henderson & Co. spring seed catalog included this new variety for the first time. They describe red celery as having a superior flavor to the green varieties that had been favored in the US. Finding the American family hesitant to try red celery, they created their pink plume variety to combine the flavor of the red with the coloring of the darker varieties. Even better was their claim that the vegetable shown in this pink plume celery drawing blanched faster and matured faster as well. Based on the lovely-full color drawing of one of their celery plants, it would seem the pink plume is much prettier as well. 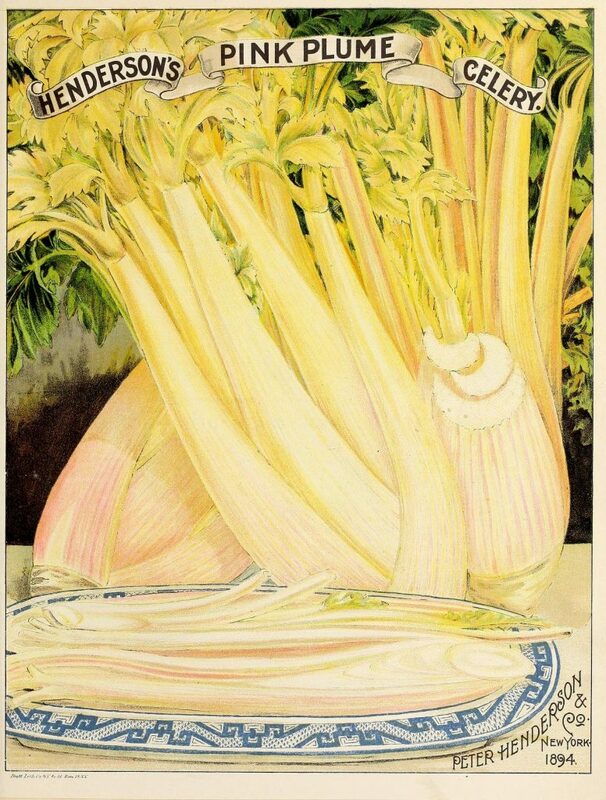 Henderson was so proud of this celery that they included a full-color illustration of it in their catalog. They show the pretty pink and green celery in full head as well as stalks placed on a blue and white plate. A quick search tells me that this variety of celery seed is still being sold today. Maybe some day we’ll try it out. As luck would have it, this pink plume celery drawing is huge. I’m only able to share with you here a slightly smaller version. Just click on the pretty celery drawing above to access and download the full-sized version.